Nice! You fixed almost everything I'd noticed except for the front logo. With the correct paper and printed color, you'd never know it was a replica (if it weren't for the notation). You've made a serious quality product. Thanks for your feedback, 50brd. I've tried to get as close to the original as possible and I think the result is pretty close, now. - Apostrophes: The apostrophe character differs from the original. Apart from the above issues I think the Star Castle manual² is finished, now. All linebreaks and the layout is supposed to be very close to the original. Could people please check whether they can spot other differences between their Star Castle paper manual and the Star Castle manual²? Anys suggestion for improvement are welcome. 50tbrd: Could you please check and confirm that this is the problem? Simplest check is to save the Star Castle manual and open it with Adobe Reader. Yes. I tried it with Explorer and it was perfect. Mozilla still had the problem. Thank you for checking, 50tbrd. The result is as expected - a problem of FireFox's built-in PDF viewer. For now I declare the Star Castle manual² (PDF, 190kByte) as completed and finished. Private usage of this PDF document is free. Any type of distribution or commercial usage of the document (i.e. you get money for the electronic or printed manual directly or indirectly) is only allowed with my explicit agreement and permission. (c) 2014. Next project: Dark Tower manual². Also I'd be very interested in a production of a paper manual of Mail Plane, but I'm good in reproducing things, not so much in designing and author new things. At a later stage I'd like to create many more (all?) GCE Vectrex manuals². But please be patient, completion of the next manual will take a while due to other non-Vectrex related tasks. The only manual I've ever seen. 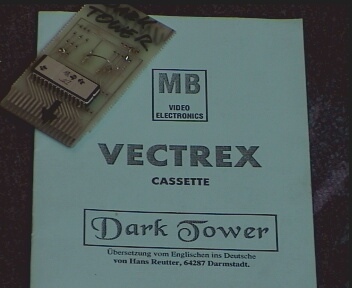 ^ Your image shows the German translation of the Dark Tower manual and a repro cartridge, 50tbrd. There must be an original - otherwise the Dark Tower PDF available at DigitalPress wouldn't exist. Already, I've contacted a member of DigitalPress and hope to get an answer. Looking at Spike's Vectrex page, if Sean Kelly had/has the original overlay than he probably had/has the original manual as well. I thought that the overlay I'd seen was homemade. Its not very indicative of the quality that GCE/MB had made for any other game. Of course it could have been a prototype that was more of a concept. 50tbrd: Right, Sean is a hot candidate to know about the Dark Tower overlay. The second person at DigitPress is Mat. The quality of the overlay graphic is an interesting aspect. Perhaps there was just a logo and the rest was created afterwards? Thanks for your reply, Mayhem. So it must have been Sean. Sean is the person at DigitPress that I had contacted. The PDF manual located at DigitPress is created from TIF files that have been scanned in and provided publicibly a long time ago. The TIF files are hosted on Vectrexer's server for example. The Dark Tower manual² has made some progress, all text and graphics are included, now. I wished the scan was in a better quality (e.g. one cannot see any of the fine text that is supposed to be on the front and back page). A first version Dark Tower manual² is completed. If you should find any typo or design glitch, let me know. Again, thanks to 50tbrd for the Dark Tower logo.